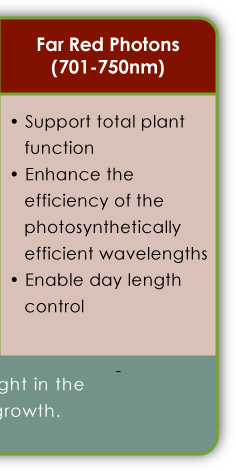 Custom-tailored TotalGrow spectra are based on extensive study of the effects of specific wavelengths on plants. Click on the color regions below to explore the science behind the TotalGrow™ spectrum. 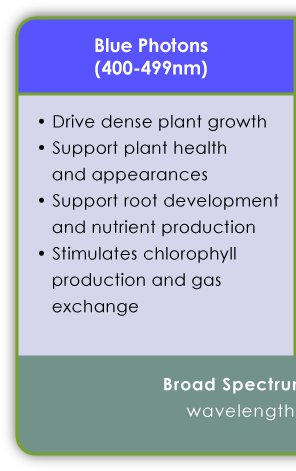 Blue light (400-499nm) efficiently stimulates chlorophyll, but more importantly it is the main activator of several critical accessory photoreceptors like cryptochromes and phototropins that positively affect many physical traits of plants. 2Sakamoto, Koji, and Winslow R. Briggs. "Cellular and subcellular localization of phototropin 1." The Plant Cell Online 14.8 (2002): 1723-1735. 3Christie, John M., et al. "Arabidopsis NPH1: a flavoprotein with the properties of a photoreceptor for phototropism." Science 282.5394 (1998): 1698-1701. 4Folta, Kevin M., and Edgar P. Spalding. "Unexpected roles for cryptochrome 2 and phototropin revealed by highresolution analysis of blue light-mediated hypocotyl growth inhibition." The Plant Journal 26.5 (2001): 471-478. 5Kagawa, Takatoshi, et al. "Arabidopsis NPL1: a phototropin homolog controlling the chloroplast high-light avoidance response. "Science 291.5511(2001): 2138-2141. 6Kinoshita, Toshinori, et al. "Phot1 and phot2 mediate blue light regulation of stomatal opening." Nature 414.6864 (2001): 656-660. 7Folta, Kevin M., and Lon S. Kaufman. "Phototropin 1 is required for high-fluence blue-light-mediated mRNA destabilization." Plant molecular biology 51.4 (2003): 609-618.